I recently purchased a 2005 C2S 6-Speed as my third car. My daily is Gen II CTS-V Sedan with some very light mods. While not as quick as that F10, still a beast with power everywhere, great brakes and suspension setup. Love that car. Having said that, the 911 is so much more engaging and such a viceral experience. All I want to do is get in this 12 year old car and drive it. Probably just not the right car for you and nothing wrong with that, just a bummer that you purchased something that you're not into. Prevoius car was a Mini S, had to "learn" to drive my 997. My first month driving my 997.1, had me wondering if I was doing something wrong. I loved the sound, was concerned about the strange smell after driving, and it didn't feel any quicker than the Mini I traded in. Once I realized that the engine came to life above 4000 rpm, I "got it". The Mini was fun, but it's not 911 fun. This is the 3.6 and currently is plenty quick/fast for my nerve. I took your advice and went for a drive yesterday and tried out sport-plus in manual mode and it was quite enjoyable, other than an odd clunk on acceleration/deceleration...feels like trans or engine mounts may need replaced. My comments on driving the 535 vs 997 was purely based on the roads I commute on(95% highway). Steering and acceleration feel around the same...lots more road noise in the 997 as expected. The steering in the WRX to me mind you feels a lot lighter than both everywhere. I need to get an exhaust and possibly engine mounts. Last edited by tehward; 12-11-2016 at 12:20 PM. Regarding the clunk in the PDK, that is normal from my understanding - this first gen PDK can be a little clunky in sport mode sometimes, so I wouldn't rush to change the mounts unless the car has high miles or your shop is telling you they are shot. Hopefully the more you drive her the more you'll love her! Two things learned from my limited (1 month) experience with an 09 PDK. It has become far less jerky and "clunky" as I learn to drive it in its different modes. Coming from a tiptronic it is taking me a while. Also, had the 6 year PDK service done at the dealer and I really think it smoothed it out to some degree. Welcome to the club - that's a great color combo. 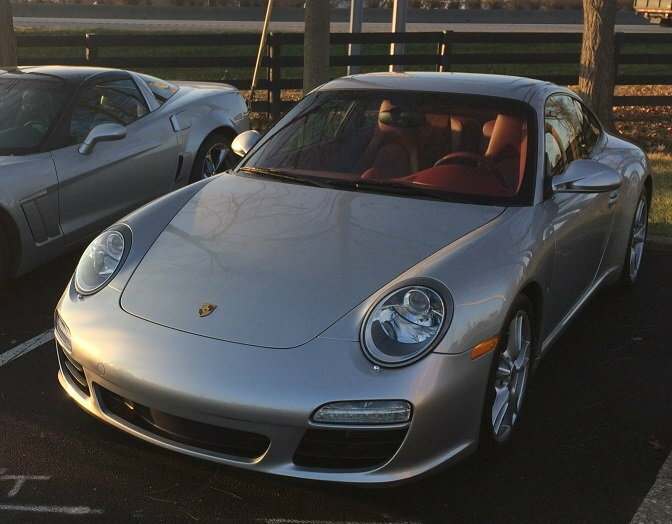 Here's my humble advice....invest $35 bucks into joining your local Porsche Club and sign up for the next HPDE. You'll be amazed at what your base Carrera is capable of and will have a hell of a time. Would love to hear your thoughts after one of those. I think commuting with my 545i (SMG) is more enjoyable than my 09 C4S. This is due to the high-rev power band of the C4S. Unless you drive aggressive from light to light, the C4S really doesn't feel or seem faster than the BMW or Honda Odyssey (which I also have). The new 991.2 seems to have fixed that problem by lowering and flattening the power band to make the car feel faster in normal driving. Turbo charged engine is great in adding low-end torque, which makes normal driving more fun if you don't mind a little turbo lag. The BMW 545i also negotiate better the bumps and the dips of the normal road. But take your 911 on a winding mountain road and you will fall in love with it for sure. So I think your problem here is that although you can daily a 997, you will not be using it at its full potential. People say that having only driven 19K on a 7 year old car is a waste. But those few miles were all memorable miles. I dream of my next drive every time I turn off the keys to exit the car. I really think the PDK was tripping me up...I'm slowly learning how to drive it in different situations and it has become more enjoyable to use. I sure do miss being able to blip the throttle on downshifts like in the Boxster, but I was never able to shift like this does. I went ahead and ordered the Rennline engine mounts to stiffen things up. I have sticker shock on these bent bits of metal...so that will have to wait. Thanks all for your support! The base car is not for everyone, and while road quality can greatly affect the enjoyment level of the car, perhaps you are not a 911 person?, it can happen, it takes a large commitment to enjoy this car fully. While there is always the chance that there is something wrong with your car, I suspect that if this is the first PDK car you've driven, the "clunk"-ing you're referring to will go away once you get acclimated to the transmission. Your foot will definitely have a short learning curve as you master modulating the throttle in stop and go traffic and at parking lot speeds (especially in sport mode). It will become second nature to you after a few trips. It helps if you've ever owned an older car with an automatic transmission with a shift kit. Abrupt shifts and slightly jerky shifting at low speeds is the small price you pay for the lightning-quick shifts you're getting. Another payback is the rev-matching downshifts you get in sport mode. I too had an E39 M5 several years ago...just bought a 997.2 C2S. It's hard to say why some love one car and others don't. Compared to a large v8 torquey beast the NA Flat-6 Porsches definitely require more revs to move but that's what I love about it! I think it takes some getting used to. Also I'm an MT guy. I recognize the benefit of the PDK but I just want to shift my own gears. It's part of the experience that makes driving do it for me. I noticed a few of the same things after I purchased it... not so exciting on a straight highway, the sound deadening isn't so great. a few clunks and a driving position that take a little getting used to. The car also takes some time to get acquainted with. It took me a few hundred miles to really get familiar with it and now I really enjoy it. The lighter front end and unique feedback, the power band and driving position are all very unique with the 997. I would say now say it's def. a reward driving. In regards to transmission clunks, I noticed mines and was very obvious clunk at low speed. I found that front transmission bolts were loose! Since then, that specific clunk is resolved but there are still random ones here and there. So check the front transmission mount. Last edited by AltVelo; 12-12-2016 at 05:13 PM.